Empowering others, diverting stuff from the landfill and cleaning your home - all in one! 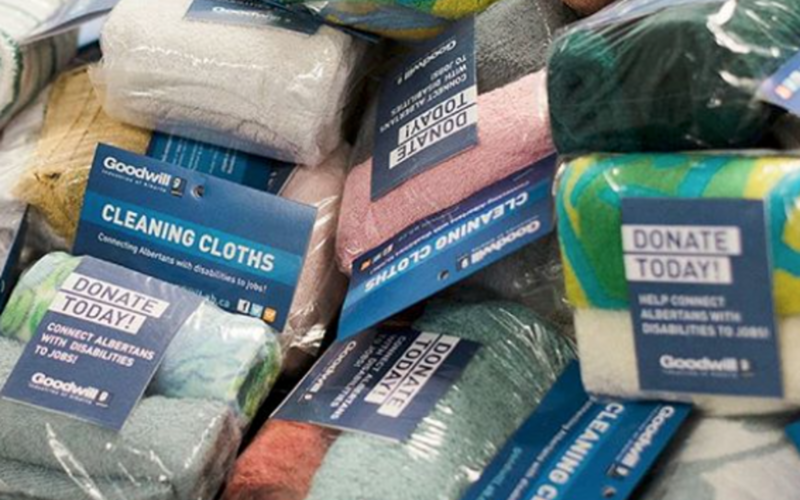 It's made possible with Goodwill Industries of Alberta's Cleaning Cloths. These tidy-up fabric swatches are produced as part of the non-profit's Commercial Services division, which is an inclusive place of employment for folks with disabilities. The cloths are made from items unsuitable for sale - clothing and materials which would otherwise be sent straight to the dump. In 2013, Goodwill diverted 3.7 million kilograms of household items out of the landfill and recycled more than 13,000 kilograms of clothing in their post-retail operations. The Cleaning Cloths come in a single or triple pack. You can buy them in stores, including their Old Strathcona location. Proceeds go right back into the organization and its many programs.